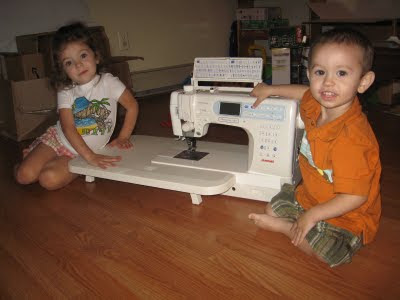 My little models, showing off the machine. Presenting my new sewing machine: The Janome MC 6600. Yipee! I've been wanting a sewing machine for a while... I was holding out buying a new one because I wanted to check out a sew&vac store in Rochester (NH) for their large selection of used sewing machines. I got pretty overwhelmed quickly at looking in the warehouse at their stock of used sewing machines. They all looked pretty blah thrown on the shelves, somewhat disorderly... newer looking machines sitting next to machines identical to the 1962 Slant-O-Matic I was trying to replace. There were only 3 machines that adjustable speed control... all looking more expensive than I wanted to put out for a used machine. We went back in the store to look at the new ones and one machine did stand out. It had the features I needed: adjustable speed control, solid metal (can handle thick materials), and up-down needle control. But it also had features I loved: built-in walking-foot (I'm always struggling with the cheap Chinese walking foot I got for my Slant-O-Matic), knee lift, extra high presser foot lift, and great lighting to name a few.... at a price of $1200. Ugh... Then they said they had a used one in the back, identical to the new one, for $550. This was at the high end of my price range for a non-embroidery machine, but it did look promising. I decided to take my time, go home and research the machine. Turns out, it is a great machine. There was even a yahoo group made for people who love the machine, with 4000+ members. *hangs head* Yes I joined - 12th yahoo group I'm in maybe? So I went back the next day and bought it. Since then I've found more things to love about the machine,I'll spare you the details, since this is pretty boring, but it did come with a large table I wasn't expecting to be included with the machine. There are a couple of things that I don't like. First, the previous owner was a chain smoker. The sewing machine is fine, but the cover and instruction book are pretty stinky. Second, I've noticed a problem with the needle being too close to the edge of every foot. If I go over a large bump it hits the foot and either breaks the needle or makes machine start acting like it's possessed (lights flash, gears groan and won't shut off). I have a year warranty, so I think I'll take it in at some point to fix that one. For now, I hold down the foot while if I'm going over a big bump. Third, I've seen the machine skip stitches on occasion. I'm still don't know why, but it hasn't been a huge deal. Other than that... the machine is great!